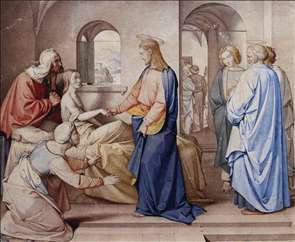 German painter, the leading member of the Nazarenes. He moved to Rome in 1810 and was based there for the rest of his life, although he made several visits to Germany. 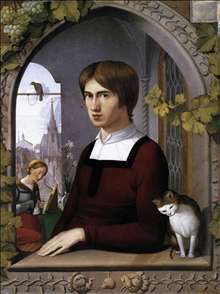 In 1813 he was converted to Roman Catholicism and apart from a few portraits (there is a self-portrait in the Uffizi) his work was almost exclusively on religious themes. 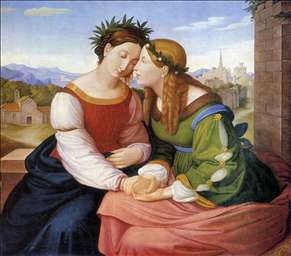 He painted in a consciously archaic style - clear and sincere but rather pallid - based on the work of Perugino and the young Raphael. The Rose Miracle of St Francis (Portiuncula Chapel, Assisi, 1829) is perhaps his best-known painting. The high-minded and didactic tone of his work won it a more sympathetic acceptance (particularly in England) than its artistic quality alone merited. William Dyce and Ford Madox Brown were among his supporters and there were affinities between his aspirations and those of the Pre-Raphaelite Brotherhood. 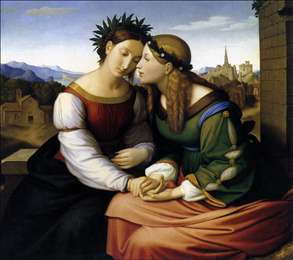 See more details about "Italia and Germania"
See more details about "Portrait of the Painter Franz Pforr"
See more details about "Christ Resurrects the Daughter of Jairu"